Successfully Added H2 Fitness Tracker Bracelet - Pedometer, Sleep Monitor, Exercise Planner, Call and Message Reminder, APP Support to your Shopping Cart. Steadily work towards a healthier future with the H2 fitness tracker bracelet. 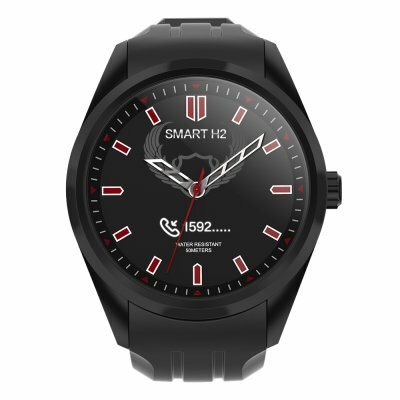 This stylish sports watch comes packed with an abundance of health and fitness features. It features a bright 0.49-Inch OLED display on which it keeps you updated on your daily activity levels. Via the mobile Application, this fitness tracker bracelet is compatible with both iOS and Android phones. The sports tracker itself has been crafted out of a comfortable silicone material which allows you to wear it throughout the day without even noticing it’s there. With its built-in 85mAh battery, this fitness tracker bracelet treats you up to a stunning 14 days of standby time. With its pedometer, your fitness tracker bracelet allows you to keep accurate track of the number of steps you take during the day. With this information at hand, you’ll be able to easily increase your daily activity levels to reach your future fitness goals in no time. Your sports watch furthermore supports an exercise plan feature that will further motivate you to stay active throughout the day. To make sure you get proper rest, your sports watch comes with a sleep monitor. This feature analyses the amount and quality of your sleep to stimulate a fast recovery after previous workout sessions. When paired with your smartphone, you’ll be treated to call and message reminders straight onto your wrist. The H2 fitness tracker comes with a 12 months warranty, brought to you by the leader in electronic devices as well as wholesale Bluetooth watches..